RACHEL CANTOR was born in Hartford, Connecticut, and raised in Rome. She worked for jazz festivals in France and food festivals in Australia before getting degrees in international development and fiction writing. Her short stories have appeared in The Paris Review, One Story, Kenyon Review, Fence, and other publications. She has received fellowships from Yaddo, the MacDowell Colony, the Millay Colony, the Djerassi Resident Artists Program, and elsewhere, and has been a scholar at the Bread Loaf, Sewanee, and Wesleyan Writing Conferences. She lives in Brooklyn. “A heroic tale unlike any other: a novel that is not about a quest but about learning that the world—our world—is full of extraordinary, mysterious wonders." “In this roller-coaster debut, fast-food corporations rule the world and a peon customer-service worker has to save it... Cantor is in control of her material, and successful dystopian satire makes more sense while you’re lost in it." 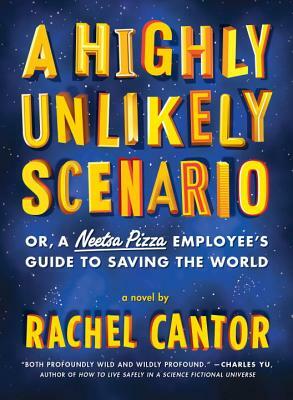 “A Highly Unlikely Scenario is a joyful book, full of the energy of undiluted invention and the thoughtful imagination of a writer to watch. It's a wild ride and much more—funny, intelligent and entirely pleasing." “Cosmic and comic, full of philosophy, mysticism and celestial whimsy. A story of listening, of souls and bodies, that is at once both profoundly wild and wildly profound." “A sharp, witty, and immensely entertaining debut... Cantor's skill in rendering complex and highly believable characters makes for an unexpectedly moving tale." “I didn't know I needed a mystical Jewish Douglas Adams in my life, but Rachel Cantor is it, and her Guide makes me shep naches every time I turn a page. Buy this book, bubeleh! It will surprise you in ways large and small, and it will fill you with delight."